So now that the GSoC community bonding period (the official one, I mean ;)) is coming to a close, I guess that a small report of my work so far is warranted. I finally got around to committing a proper Eigenfaces implementation in libface. To the uninitiated, Eigenfaces is a subspace method for face recognition, that uses PCA for dimensionality reduction in the training set. You can learn more here. The accuracy of detection is, IMHO, similar to Picasa. Now, there’s no concrete way to test that in Picasa, but I find Picasa to encounter the same problems with faces rotated in 3D. There’s always some faces that one detects but the other does not. Alex gives me similar feedback about iPhoto. A photo of KOffice developers, revealed by a random google search. Next – Face Recognition. As my fellow GSoC candidate Kunal Ghosh for this project rightly pointed out, updating the trained database of faces with a new face requires retraining of the entire database, if you use Eigenfaces. We used a simple workaround for that – we store faces in multiple databases – each DB is a chunk of 50 faces. Updating one database (50 new faces in one go) takes only about 1 second (you’re supposed to say WOW there) on my 1.6 GHz laptop. So it can be agreed upon that speed is not much of an issue with training. There are issues with recognizing faces with 3D rotation, Although this isn’t decided at the moment, I might apply GLR (Global Linear Regression) for that. This technique, as described in the paper you just downloaded (if you clicked on that link), can be applied to the problem at hand, to generate a virtual frontal face from a rotated face. 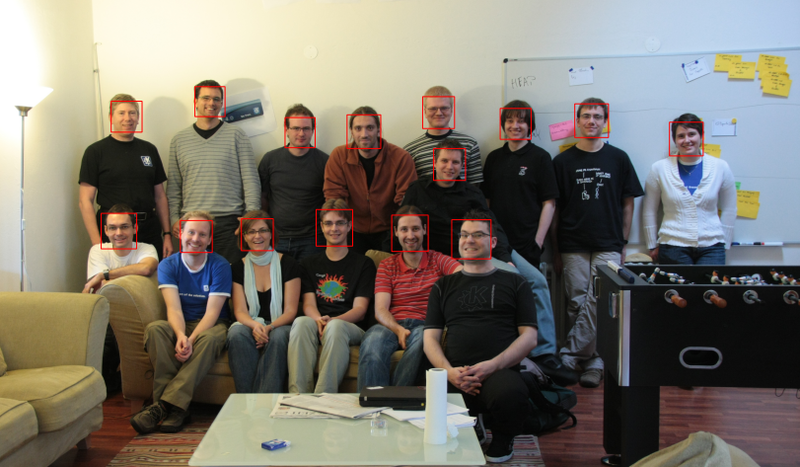 I’ll be posting a video demonstrating Picasa’s and libface’s detection side-by-side soon!